Coach Craig Robinson comes back home and tames the Cougars 92-66. Chicago native and Whitney Young graduate, Ahmad Starks exploded in the first-half knocking down three-straight from downtown. In fact, at one point, he had more points than the Cougars (8-7). Starks finished with 13. The Beavers (10-2) were led by Devon Collier who drained 19. The Pac-12 team at one point had as much as a 26 point lead (52-26) which included five players in double digits. This is the Beavers third game in a row with over 20 assist and they shot 51.6% from the field and snagged 48-boards of which 37 were defensive. NOTE: All of Starks points came in the first half. As for the Cougars (0-12), it was a tough contest for shooting (29.7%) from the field. They were able to demonstrate short burst of success on the court, but they were not able to trade basket with this PAC-12 team. Lee Fisher led the team with 17. This was definitely one of those guarantee games we talked about in one of our latest articles. Thoughts on these money games? Click here to send us an email (info@asnn365.com, or reply in the comments section below. The Beavers play their first conference game December 29 against Washington at 6:00pm. The Cougars travel to Cincinnati December 23 at 6:00pm. ROSEMONT: DePaul (6-3) defeated Chicago State (0-9) 102-95 behind the play of second-year guard Cleveland Melvin who finished the contest with 30. The Blue Demons jumped out to an early double-digit lead and maintained as much as a 17 point lead (85-70) in the second half. The Cougars were able to narrow the score in the first half to two points (49-47) after a technical foul was called against Blue Demons Brandon Young with 2:21 in the first half. From here, the Cougars nailed seven of eight free-throws. But in the second half, it was all DePaul. Young dropped 21 to spark the team. Cougars were led by Matt Samuels with 20 followed by Lee Fisher who added 19. Chicago State did not play a bad game overall. In the first half, they shot 16-30 (53.3%) and 22-45 (48.9%) in the second half compared to DePaul 17-39 (43.6%) in the first, and 18-37 (48.6%) in the second. Cougars also showed great hustle in the first half despite their current record (0-9). If they can keep up this level of intensity, things will begin to turn around for them. “The way we played is totally out of character,” concluded coach Purnell. The Blue Demons came into this game after a BIG Chicagoland win against Loyola-Chicago (69-58) on Wednesday, while the Cougars, on the other hand, have been off for a week, concentrating on settling the team down and focusing on their game (Toledo 61-73). The Cougars will be traveling to Wichita State on December 14. 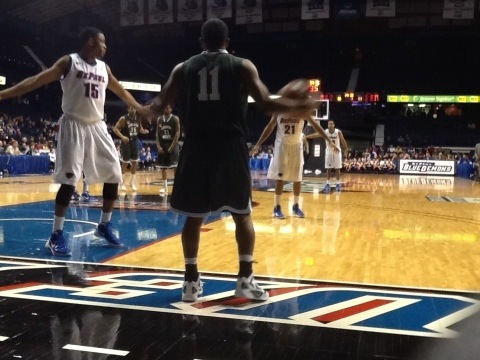 DePaul travel to Northern Illinois on the same date. This was both teams 10th time meeting and DePaul has won them all.